(Nanowerk News) Using a mixture of gold, copper and platinum nanoparticles, IBN researchers have developed a more powerful and longer lasting fuel cell material. This breakthrough was published recently in leading journal, Energy and Environmental Science. Fuel cells are a promising technology for use as a source of electricity to power electronic devices, vehicles, military aircraft and equipment. A fuel cell converts the chemical energy from hydrogen (fuel) into electricity through a chemical reaction with oxygen. A fuel cell can produce electricity continuously as long as there is a fuel supply. Current commercially available fuel cells uText Box: From left to right: Dr Xianfeng Yang, IBN Research Scientist; Dr Xiaojun Chen, IBN Senior Research Scientist; Dr Jinhua Yang, IBN Research Scientist; and Prof Jackie Y. Ying, IBN Executive Director and Senior Group Leaderse platinum nanoparticles as the catalyst to speed up the chemical reaction because platinum is the only metal that can resist the highly acidic conditions inside such a cell. However, the widespread use of fuel cells has been impeded by the high cost of platinum and its low stability. 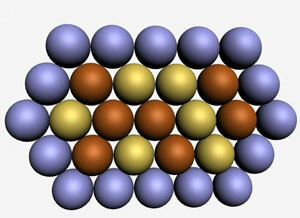 An illustration of the new IBN nanocomposite material which is composed of gold-copper alloy atoms in the core and platinum atoms at the outer layer. To overcome this limitation, a team of researchers led by IBN Executive Director Professor Jackie Y. Ying has discovered that by replacing the central part of the catalyst with gold and copper alloy and leaving just the outer layer in platinum, the new hybrid material can provide 5 times higher activity and much greater stability than the commercial platinum catalyst ("Stabilization and compressive strain effect of AuCu core on Pt shell for oxygen reduction reaction"). With further optimization, it would be possible to further increase the material's catalytic properties. IBN’s new nanocomposite material can produce at least 0.571 amperes of electric current per milligram of platinum, compared to 0.109 amperes per milligram of platinum for commercial platinum catalysts. This is also the first time that a catalyst has been shown to enhance both the stability and activity for the fuel cell reaction with a significantly reduced platinum content. To make this catalyst more active than the commercial platinum catalyst, the researchers have designed the core of the nanocrsytalline material to be a gold-copper alloy, which has slightly smaller lattice spacing than the platinum coating on the nanocrystal’s surface. This creates a compressive strain on the surface platinum atoms, making the platinum more active in the rate-limiting step of oxygen reduction reaction for the fuel cell. Replacing the core of the nanoparticle with the less expensive gold-copper alloy cuts down the usage of platinum, a highly expensive noble metal.